Background: From North Korea's official Korean Central News Agency (KCNA) taken on Aug. 29, 2017, showing North Korea's intermediate-range ballistic rocket Hwasong-12 launching from an undisclosed location near Pyongyang. (STR/AFP/Getty Images.) Foreground: North Korean leader Kim Jong Un. (Ed Jones/AFP/Getty Images). Image compositing by Tom Ozimek / Epoch Times. North Korea said it is a “pipe dream” for the United States to think it will give up nuclear weapons, adding that the latest UN sanctions were an “act of war” against their sovereignty. The statement was carried by the North’s official Korean Central News Agency (KCNA), an official mouthpiece of the Pyongyang regime, as reported by The Associated Press. “If the U.S. wishes to live safely, it must abandon its hostile policy towards the DPRK and learn to co-exist with the country that has nuclear weapons and should wake up from its pipe dream of our country giving up nuclear weapons which we have developed and completed through all kinds of hardships,” said the KCNA statement. The declaration comes in the wake of a North Korean foreign ministry statement on Sunday that called the latest U.N. sanctions an act of war and equivalent to a complete economic blockade. North Korea said those who voted for the sanctions would face its wrath. The U.N. Security Council unanimously imposed new sanctions on North Korea on Friday for its recent intercontinental ballistic missile (ICBM) test, seeking to limit its access to refined petroleum products and crude oil, and its earnings from workers abroad. The U.N. resolution seeks to ban nearly 90 percent of refined petroleum exports to North Korea by capping them at 500,000 barrels a year and, in a last-minute change, demands the repatriation of North Koreans working abroad within 24 months, instead of 12 months as first proposed. The U.S.-drafted resolution also caps crude oil supplies to North Korea at 4 million barrels a year and commits the Council to further reductions if it were to conduct another nuclear test or launch another ICBM. The new resolution was tantamount to a complete economic blockade of North Korea, the ministry said. “We define this ‘sanctions resolution’ rigged up by the U.S. and its followers as a grave infringement upon the sovereignty of our Republic, as an act of war violating peace and stability in the Korean peninsula and the region and categorically reject the ‘resolution,'” it said. “There is no more fatal blunder than the miscalculation that the U.S. and its followers could check by already worn-out ‘sanctions’ the victorious advance of our people who have brilliantly accomplished the great historic cause of completing the state nuclear force”, the ministry said. 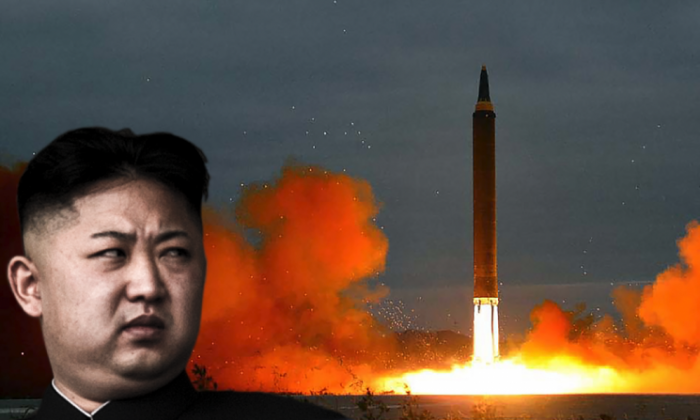 North Korean dictator Kim Jong Un on Nov. 29 declared the nuclear force complete after the test of North Korea’s largest-ever ICBM test, which the country said puts all of the United States within range. The North Korean foreign ministry claims its nuclear weapons were a self-defensive deterrence not in contradiction of international law. “We will further consolidate our self-defensive nuclear deterrence aimed at fundamentally eradicating the U.S. nuclear threats, blackmail and hostile moves by establishing the practical balance of force with the U.S.,” it said. “The U.S. should not forget even a second the entity of the DPRK which rapidly emerged as a strategic state capable of posing a substantial nuclear threat to the U.S. mainland,” it added. The communist regime’s old allies, China and Russia, both supported the latest U.N. sanctions. Tension has been rising over North Korea’s nuclear and missile programs, which it pursues in defiance of years of U.N. Security Council resolutions. In November, North Korea demanded a halt to what it called “brutal sanctions”, saying the round imposed after its sixth and most powerful nuclear test on Sept. 3 constituted genocide. U.S. diplomats have made clear they are seeking a diplomatic solution but proposed the new, tougher sanctions resolution to ratchet up pressure on North Korea’s leader.